A nondescript rock, easily confused with greenstone, phyllite, and chlorite schist. What makes greenschist greenschist is that it has undergone low grade metamorphism (greenschist facies), to produce chlorite crystals with a schistose foliation Aside from that it is hard to define distinguishing features. In general, the term greenschist applies to any rock that fits this description. Even though greenschist does not imply a specific parent rock, for our purposes we will assign a shale parent as a way of distinguishing it from a greenstone, which has a mafic parent. 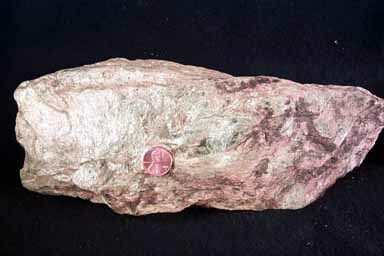 Usually, the best you can do when finding a chlorite schistose rock is to find out what the parent is. If the parent is a shale the rock is a greenschist. If basalt the rock is greenstone. If you don't know " greenschist" is the field term for any chloritic schistose rock. Greenschist is associated with major mountain building events when mafic igneous rocks (basalts or gabbros) are metamorphosed through depth of burial, and proximity to batholiths (click picture for larger version). The next rock in the sequence is amphibolite.